Preheat oven to 350º. Spray 2 10-inch fluted tube pans with cooking spray. In a large bowl, combine cake mix, water, oil and eggs. Mix until smooth. Divide batter evenly between two pans. Bake for 35-40 minutes or until an inserted toothpick comes out clean. Cool in pan for 10 minutes; transfer cakes to a wire rack and cool completely. In a medium bowl, combine cream cheese frosting and food coloring. Mix thoroughly until an even color orange is achieved. Reserve. Using a knife, level the base of each cake to create a flat surface. In one of the cakes, create a trench, leaving a ¼-inch perimeter around its circumference. Pour the candy corn into the trench. Spread a thin layer of the orange frosting onto the base of the cake that does not have the candy to create a “glue.” Place on top of the candy-filled cake. Cover the entire cake with the remaining orange frosting. 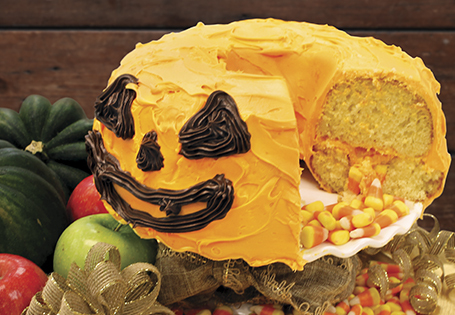 Using the chocolate frosting, pipe a jack-o’-lantern face onto the cake. TIP: Bake cakes the night before for a quick assembly the day of.